We're sure that as a creative you love notepads, pencils and all other things stationery. But even if you're the biggest stationery fan on the planet, a tablet with a stylus is a fantastic thing to buy and can be a real asset to your creative work. A tablet with a stylus is a hugely useful tool for getting your work done, and it's well worth looking into getting hold of one. What's best of all is that you absolutely do not need to spend a fortune on a tablet with a stylus. Whether you're looking to work with an iOS, Android, Mac or Windows operating system, there are plenty of options available for knock-down prices. 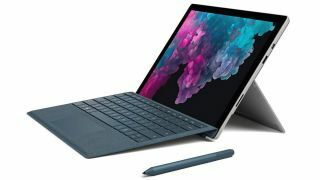 We've scoured the internet to suss out which are the best of the best, and present to you the best tablets with a stylus that money can buy right now, so that you can make the right decision for what you need. And if you're after a bargain, we've included some bargain options too. If, after considering the options here, you think you'd be better suited to a dedicated drawing device, we've got the best drawing tablets at the best prices for you too. So what's the downside? Well, this laptop-like performance means laptop-like prices. You won’t see much change from £1000 for the smallest 64GB storage, and you’re certain to want more. Add on the additional expense of the Pencil and this is the most expensive iPad ever made by some margin. Being free from Apple’s grasp, there are some advantages to going with Android over iOS. The Galaxy Tab S4 bundles a Samsung S Pen with the device, and it'll set you back around $660/£600, making it much better value for money. And thank the heavens, you can expand the internal storage with SD cards. If you're primarily looking for a tablet with a stylus for drawing, consider investing in a dedicated drawing tablet. Our favourite is the Wacom Cintiq 22HD: its large dimensions (it's not really one for shoving in your bag too often) mean that you get a total of 50cm x 30cm of total drawing area – perfect if you want a more detailed design than most normal tablets allow you to execute. The super sensitive stylus won't hurt to this end, either – we can't think of another drawing tablet out there that will give you more accurate results. We eyed the Lenovo Yoga Book with a combination of intrigue and suspicion when it was first announced. It's a kind of tablet-laptop hybrid with a digital, capacitive keyboard that doubles up as a handwriting or drawing surface. But the result is a tablet with a stylus that's well worth owning. We know the Yoga Book won't be for everyone (the 180-degree fold back screen means it's much chunkier than most other traditional tablets), but Lenovo's unique proposition means its well worth considering if you can't decide between a laptop and a tablet. Huawei seems to have an army of tablets in its arsenal, ranging from the basic MediaPad M3 model, which is super-affordable and can do simple note taking, to this Pro model, with some real performance under the hood. This tablet still won't set you back anywhere nearly as much as the iOS or Windows tablets, and is a genuinely good option. Despite the relatively low price point, you still get an excellent screen and sufficient power for most tasks. The sleek, light aluminium frame is practical and won't embarrass you if you pull it out at a coffee shop. It's also worth noting that if you've got little ones, Huawei recently unveiled a 'Lite' version that's lower-specced, (slightly) lower-priced and designed for younger users. You can head over to TechRadar to read a hands-on review of the Lite tablet – while it's a nice addition to the range, the kid-friendly focus means the M5 Pro is very much still the better buy for creatives. Specialising in pressure sensitive drawing tablets and high-quality accessories, Wacom is leading the pack when it comes to designing styluses (or, if you prefer, stylii). The clue is in the name as to what the Bamboo Sketch is best at – precision drawing and natural looking sketches. The two customisable shortcut buttons mean you can make it really convenient to use, too. This Wacom stylus is only for iOS devices, so is a cheaper alternative to the Apple Pencil. There are more options to choose from within Wacom's wide stylus array. In the cold light of day, a tech company specialising in styluses for note-taking sounds pretty unsustainable. And yet the 2010 Kickstarter firm Adonit has managed to carve out a real niche. The Adonit Pro range has now hit its third incarnation and, with its textured grip and precision disc tip, is the ideal tool if jotting notes on your tablet is essential to you. It's designed to feel exactly akin to using a regular ballpoint pen, can be used on all touchscreens (iOS and Android included) and is relatively inexpensive.